Here it is, the Christmas get together! An overnight stay in a soft play fortress. Everyone arrived with excitement and energy, but would it last until the next morning? With a quick introduction and a timetable of events the unit were set loose into the area. Many were keen to try this devious drop, while others were satisfied just running around and exploring the area. A buffet was provided and the evening had begun, but could we all survive until the next morning? Only time could tell. Possibly about halfway to midnight we gathered in the middle of the zone, (which quickly became our meeting place for the rest of the event) and found out who out patrol leaders were going to be going forward, Faye, Will L, Rob and Josh. Congratulations to these guys, we’re sure they’ll make great leaders for when we go out to America! After an hour or two we were called into the middle of the zone to split off into four teams, these teams became the teams we would be in for our laser tag game that was just around the corner. With teams decided we all retreated back to a side room to hang out while the first teams played their game of laser tag. While the games were going on, there were some interesting pastimes happening, including what seemed like a workout competition. 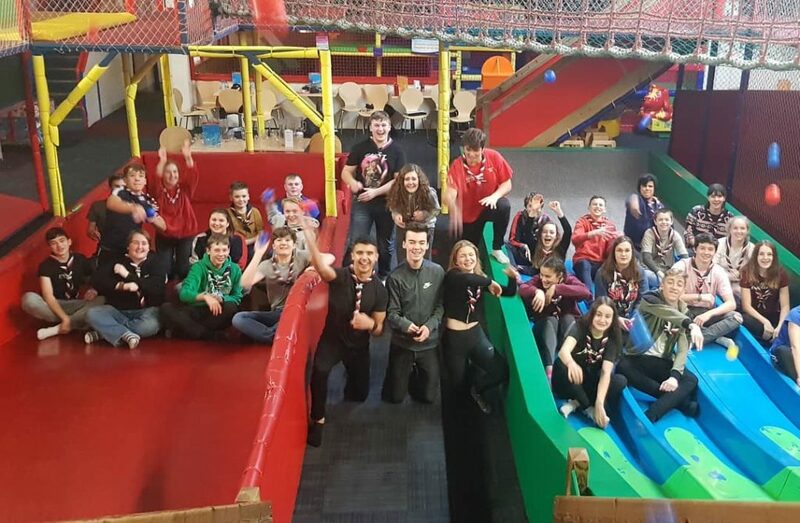 The games themselves were fun and competitive, whether playing every man for himself or in teams: it made for a good activity, and of course, it was played in the dark- the only way to properly play laser tag if we’re honest. Now moving further into our morning we were tasked in putting together a short 15 second clip of ‘Who Unit 68 are’, and in true fashion we delivered. The clip was organised by our new patrol leaders, and consisted of us yelling out who we are and throwing plastic balls towards the camera, which was oddly fun to do. Then we all went down this four lane slide as we had to make up the 15 seconds, we also had to make our unit number ‘68’ too, for which we made the two numbers with a selection of volunteers. And that was the clip sorted. By this time we were early into the morning and the energy levels were running low, a select few found places to nap while the rest of us made the most of the play zone. Towards the end of the event we all sat down and got given a card and a gift- it’s Christmas after all, it is the time of giving. But what we didn’t expect was what the gift actually was. Last meet-up we were deciding what kit we would like branded, and we came up with ideas. But what we held in our hands was our first bit of branded kit: a multifunctional headwear with our badge printed onto it. It’s safe to say that it was well received. We wrapped up the event with a few more games before we started to head home, and I would like to finish this by saying a warm welcome to the new members of the Unit. The first being our new leader Simon, he was a fun an energetic chap who did help a few people overcome fears while on the event, and his catchphrase of ‘Morning!’ will quickly become custom, and to Annabel and Daniel, who will be joining the family and the adventure when we fly out next year, all three of them were welcomed with open arms. Once more, a big thank you to the leaders for running this event, a welcome to the newcomers, and Happy Holidays from Unit 68. We’ll see you in the new year – when our adventure starts to get real!